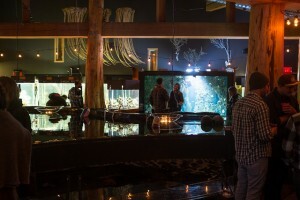 Otalith Launch Party at Ucluelet Aquarium. UCLUELET – On May 16 and 17, 2014 the Otalith Music Festival threw two amazing launch parties in Ucluelet and Tofino respectively. The first featured The Slack Tide String Band and Jon Middleton at the Ucluelet Aquarium, and the second hosted Victoria’s Carmanah at the Tofino Community Centre. 2013’s Otalith Music Festival hosted acts like The Cave Singers, Current Swell, White Buffalo, Kathryn Calder, Northcote, and Yukon Blonde among others in arguably the most intimate settings you’ll ever see any play in. Otalith is the festival for the people looking to escape the crowds, but still enjoy the community feeling of any major music festival. 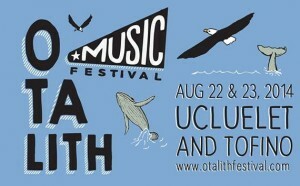 Unlike last year, the second annual Otalith Music Festival not only takes place at their beautiful festival grounds in Ucluelet, but in various locations throughout the Tofino area as well. Taking full advantage of indoor clubs, bars, and a brewery on the Friday night of the festival. 2014 Otalith Music Festival Lineup. 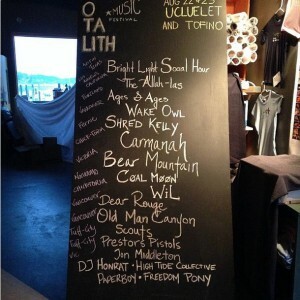 This year the second annual Otalith Festival taking place August 22nd and 23rd will feature Bright Light Social Hour, The Allah-las, Ages & Ages, Wake Owl, Shred Kelly, Carmanah, Bear Mountian, Coal Moon, Wil, Dear Rouge, Old Man Canyon, Scouts, Prestors Pistols, Jon Middleton, DJ Honrat, High Tide Collective, Paperboy, Freedom Pony, and more to be announced in the coming months. Austin’s Bright Light Social Hour has remained one of the most talked about acts in Victoria since their appearance at 2012’s Rifflandia Music Festival. While this won’t be their only visit to The Island this summer it will certainly be the most memorable as there are rumours of a brewery performance in Tofino on the Friday night of the festival. Another band still making waves after their Rifflandia 2013 performances is Bear Mountain, a band that was formed as a side project to Ian Bevis’s Top Less Gay Tekno Party. Bear Mountain has seemed to have gained more traction that their predecessor and have notably opened for Hot Chip, Bloc Party, and MS MR as well as playing major international music festivals like Lollapalooza and Sasquatch. Certainly a must see at Otalith. The Otalith Music Festival continues to strive for a uniquely west coast feeling festival. A vibe that can only be felt and not described. If you are looking for an intimate music festival experience in one of the most beautiful places in the world while drinking amazing craft brews and making new life long friends this is the festival for you. Otalith not only promises you an amazing festival experience, but something you will remember and cherish for the rest of your life.